Hardware sensors monitor utilizes sensor chips on smart motherboards to track system and CPU temperatures, voltages and cooling fans. 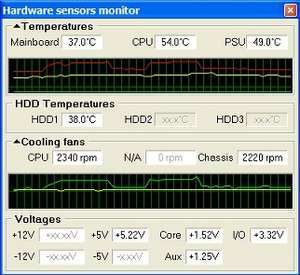 By quickly catching an overheated PC, you can prevent disasters such as system instability or damage. The program is resource friendly, resides quietly in the system tray, and continually monitors the various parameters. By clicking its icon, you'll view real time values for each component. Hardware Sensors Monitor 4.5.4.2 is a shareware program and can be used as a demo to try the software until the free trial period has ended. A full version of the program is available after the trial period ends. For security reasons, you should also check out the Hardware Sensors Monitor download at LO4D.com which includes virus and malware tests. Additional screenshots of this application download may be available, too. 4.62 out of 5 based on 32 ratings. Hardware Sensors Monitor has a presence on social networks. Hardware Sensors Monitor download been highly rated by our users.